That’s right, cheese lovers, I’m ringing in 2012 with a CHEESE BALL. I hope you’ll bring a wedge for the giant cheese board I plan to create. And I hope you’ll put on a cheesy outfit, but it’s not required. Why a Cheese Ball? Well, I just feel we should meet face to face. After all, I’ve been blogging for three years, and a grrl gets tired of tapping keys. I want to tap my foot to a beat. I want to go cheese Gaga. We dance cheek to cheek to some live jazz, we feast. Uh, that’s right. I’ve got a Mike Geno cheese print to give away. 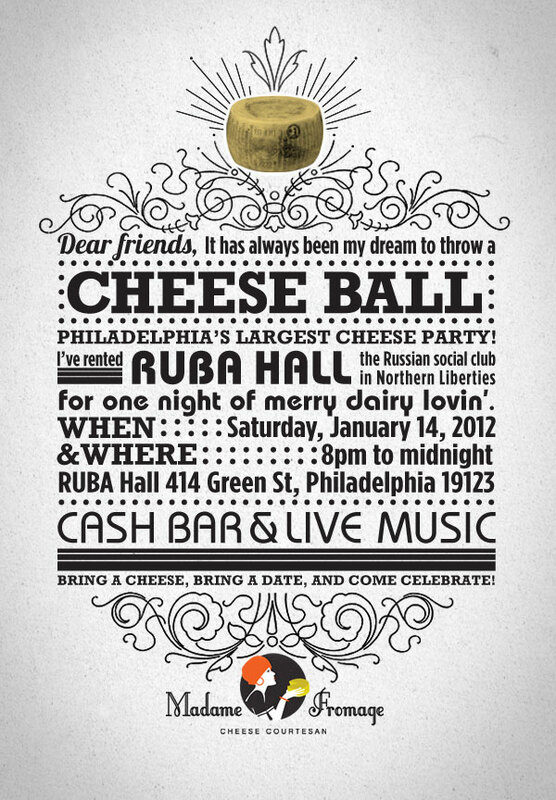 Will you be crowned King or Queen of the Cheese Ball? Perhaps. If so, we must disco. DJ Raclette will be making a special appearance from Wisconsin. Midnight: The private party officially opens to RUBA Social Hall members. RUBA is open until 3 a.m. You can stay and meet handsome Russians or head home to recuperate. The Cheese Ball does not require tickets. You must love cheese to attend. Note: The invitation above is courtesy of the daringly awesome Stefania Patrizio Design. That sounds amazing. I wish I was in Philadelphia and could attend. Poster art is outstanding. Who designed? Stefania Patrizio -- a link to her site is in the last line of the post. She's in Philly. And she is awesome. Thanks for the comment! This sounds amazing. If we have money we will try to be there! Also, I've been pinning your photos to Pinterest, have you considered starting a Pinterest with boards of different cheeses and cheese board ideas? I think that would be fantastic! I'd be happy to give you an invite to it, I use it to keep track of recipes I want to try and things I want to craft, etc. Is the only cost of admission a wedge of cheese? Is the only cost of admission a wedge of cheese and an undying passion for your blog? This is correct, Saunv. There isn't a cover charge -- the only cost of admission, if you will, is a wedge of cheese. I am providing the space, the music, and the baguettes. It's a once-in-a-lifetime celebration. I vote for an annual thing. Next year: Cheese Disco!